In search of a refreshing beverage in the heat and humidity of Saigon, I was delighted to come across "Bird's Nest Drink." While all the usual suspect soft drinks were available, I figured "how could I go wrong with an ingredient list that read 'Water, Sugar, White fungus, Bird's Nest'?" The drink itself tasted like sugar water but had the added bonus of floating jelly chunks throughout (presumably fungus and nest?). This drink does not go down smooth, at all. Bird's nest is a popular ingredient in many Asian dishes. The particular type of nest used is that of a Cave Swift which unlike most birds, makes it's nest from it's spit. So, if you are having cravings for sugar water with chunks of gelatinous bird spit, head to your local Asian market now! Within hours of arriving in Phnom Penh I had a hankering for some local food. While searching for a suitable restaurant I passed by a woman grilling up some chicken on the side of the road. When I took a second glance I realized that these were no chickens, but were clearly pigeons with their heads and feet still in tact. They were cheap, so I bought one. The meat was quite good, similar to duck, but eating an animal with it's head still attached took some getting used to. I still wonder if those pigeons were raised for consumption or just caught around town. As a friend and I we're playing pool in a small bar called "Nam Bar" in Hoi-An, Vietnam we met the friendly barkeep named Moon. At one point Moon asked us if we wanted to try some "Snake whiskey." He took us to the back room of the bar where there was a large jar of anonymous 'animal parts' with some liquid, which was presumably whiskey. Moon explained to us how they made it themselves in house from ingredients purchased from a traditional Chinese medicine shop and how the liquid had many health benefits for which he takes at least a shot a day. Dr. Moon then prescribed my friend and me a shot, I was happy to accept, my friend...declined the offer (how rude). When poured, the shot contained no obvious animal extremities a appeared only as a yellowish liquid. Down the hatch......uggh! Not the best tasting liquor I have had, perhaps one of the worst, but if the what Moon tells me about the health benefits is true, I'll take it over Buckley's any day. 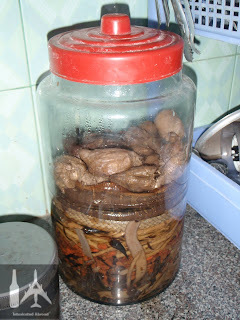 Le Mat, a village on the outskirts on Hanoi, is home to an assortment of restaurants all serving entirely snake meat. Eating snake meat is traditional in northern Vietnam and is an activity for 'Manly men.' 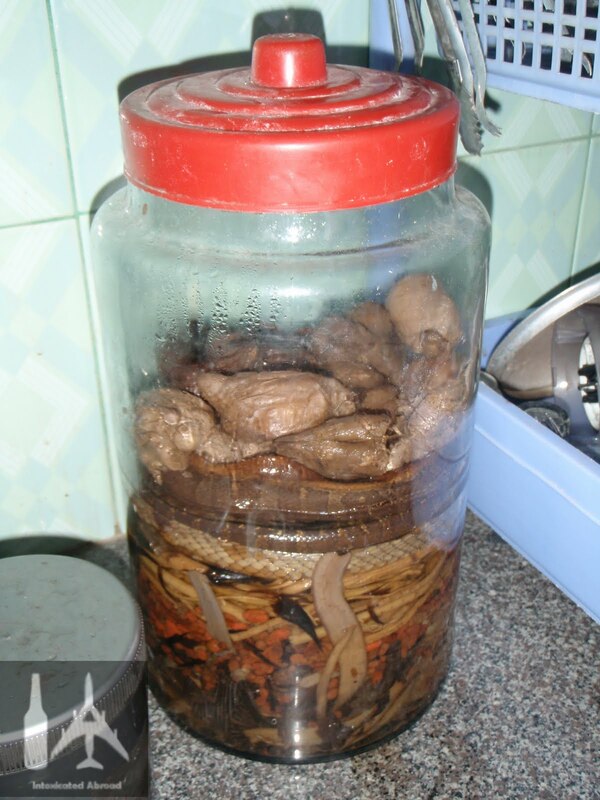 In traditional Vietnamese medicine drinking the blood of snakes (particularly the cobra) is believed to increase sexual virility. Knowing that I was certainly a 'manly man' in search of this 'sexual virility,' I took a tour to Le Mat. The tour took us to a small restaurant on the banks of the Red River. Once we were seated the waiters brought a live snake that they prompted us to kill (so you know it's fresh). The waiters then assisted us in preparing shot of snake blood with the still beating heart and bile mixed with local spirits. The taste was almost entirely that of the very rough spirits and the tiny heart was unnoticeable in the shot. Once the shots are taken the snakes were brought back to the kitchen to be prepared. The snake dishes I had were phenomenal. I was truly amazed with how delicious everything was. I think it was mostly down to the great blend of spices that they used which could've made any food taste great. So what does snake taste like? I would have to say, it tastes like frog. 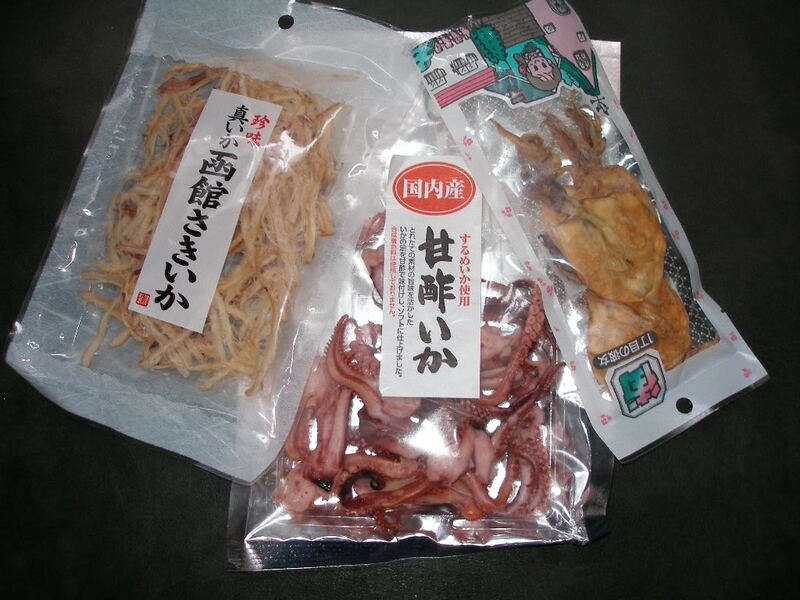 I picked up a pack of dried Octopus at the Tokyo Narita Airport in an attempt to get rid of my last remaining Yen. I decided to save them until I got home so that my whole family could try. Obviously, they were delighted. Eating the octa-jerky was like chewing on a fishy tasting chunk of rubber. I think it could work well as a gum substitute for people not into the normal minty gum flavours. People looking for that fishy breath scent that says "yes ladies, I would like to make out." I tried chicken feet for the first time as a post-bar snack in Vietnam and they were not as "finger licking good" as I had hoped. My honest opinion was "what's the point." Most of the edible meat on the feet consists of skin and tendons, without much muscle. That means that all you get out of chicken feet is some dried up skin and chewy tendons. 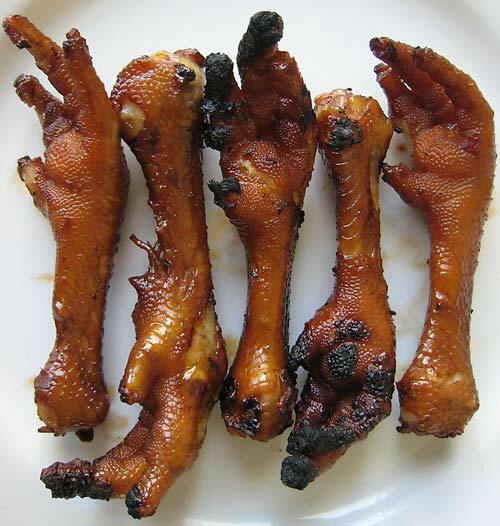 I really have no idea why chicken feet are so popular in Asia. In China they are called Phoenix talons, so maybe pretending you are eating a mythical creature makes it more palatable. Though, personally I don't think I'd have much of a taste for Unicorn's hoof either. Useless. A brief rest-stop en-route from Phnom Penh to Siem Reap presented me the opportunity to try a different type of meat than I am used to, from the world's most abundant protein source: Bugs. I saw the large bowls containing various bugs as soon as I stepped off the bus but I was reluctant to immediately go for it as I had just woken up. An elderly local woman saw me eyeing the bowls of bugs and offered me a cricket from her own personal stash that she had bought. She even prepared the cricket for me by removing the legs and wings. The cricket wasn't bad, it had been soaked in spicy oil which dominated the flavour. The best part was that the woman seemed very happy to have shared a part of her culture with me. Encouraged by the 'not so bad' cricket I was tempted to expand my palate further. The next bowl over contained large black tarantulas soaked in a similar oil concoction. I bought one and proceeded to eat a couple of the legs, which were crunchy and not dissimilar to the cricket. It was only when I bit into the spider bulbous abdomen that I began to question some of my choices. The inside of the abdomen was black and chalky with an unappealing flavour. Needless to say, I had had enough spider for at least a little while. 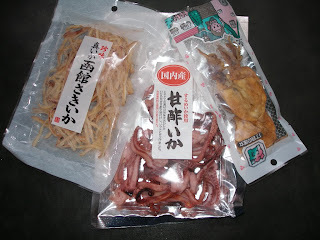 Part 3 coming soon: The weirdest foods I havn't eaten (yet).